Hakusan, Japan, October 29, 2015 – EIZO Corporation (TSE:6737) announced the release of the DuraVision FDS1921T, a highly durable 19-inch touch panel for use in factories, hospital clean rooms, and public access areas. 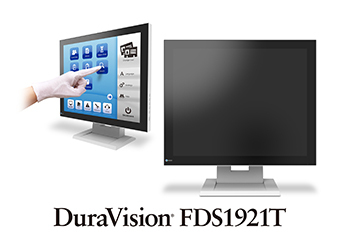 The DuraVision FDS1921T’s fully flat design enables seamless touch operation that reaches to the edges of the screen. The monitor uses surface acoustic wave technology (SAW) which exhibits higher light transmittance compared to resistive touch screens for high visibility. The screen accepts touch input from both bare and gloved hands, as well as styluses, making it convenient for a range of applications. 2-point touch lets users tap, pinch, and spin at the light touch of a finger. The multitouch interface is supported by standard Windows 7, 8, and 8.1 drivers so there is no need to install additional drivers to carry out touch operation. The non-scratch surface is made of reinforced glass with a hardness of 7H (Mohs scale) for withstanding regular use. The DuraVision FDS1921T can also withstand temperatures ranging from 0 - 40°C for increased durability in industrial environments. The DuraVision FDS1921T is equipped with a long-lasting LED backlight with a wide dimming range of 0.5 cd/m2 to a high brightness of 450 cd/m2. This ensures maximum visibility when viewing the monitor under varying ambient lighting conditions. The DuraVision FDS1921T will be shipping from November 2015. Date of availability varies by country so contact the EIZO group company or distributor in your country for details.